The missing shoe kicks off a delightful comic sequence that would make Lubitsch take notice with its comedy of errors confusion, understated visual gags, and ingenious narrative momentum. By the time the footwear makes its way back to Odette’s home, it has effortless introduced us to the major players of our romantic comedy and revealed a little something of their character as well. The sequence also reveals the light touch that Autant-Lara brings to the comedies of this set. His productions aren’t as lush or laden with mood as Marcel Carne or as visually dynamic or dramatically taut as Jean Grémillon, two French contemporaries who also produced masterpieces under the censorship and heavy restriction of the Occupation, but they are deft and sweet and embrace a romantic idealism embodied in his leading lady. The petite Odette Joyeux was 28 when she played the 16-year-old Chiffon but her wide eyes, open face, and spunky spirit embodies the innocence and guilelessness of youth so beautifully that you don’t even think to question it. Le mariage de Chiffon is something of a trifle but it is a thoroughly engaging and endearing film where there are no real villains and a spirit of generosity guides the romantic journey. In this story, youth is so innocent it doesn’t even realize it is in love, wisdom does indeed come with age, and the most unlikely characters are driven to action to redeem their role in the misfortune of others. Next to the darkness of France’s poetic realist dramas, this is a sunny ray of romantic faith and it is buoyed by bringing the action outdoors; the open fields and sunny days allow the film to escape the confines of studio sets and breathe, and the natural light warms the sensibility. It was a hit—perhaps it was just the shot of optimism audiences in France needed—and Autant-Lara reunited the core of his team—screenwriter Jean Aurenche, cinematographer Philippe Agostini (working as camera operator here), and of course leading lady Joyeux—for his next three films. 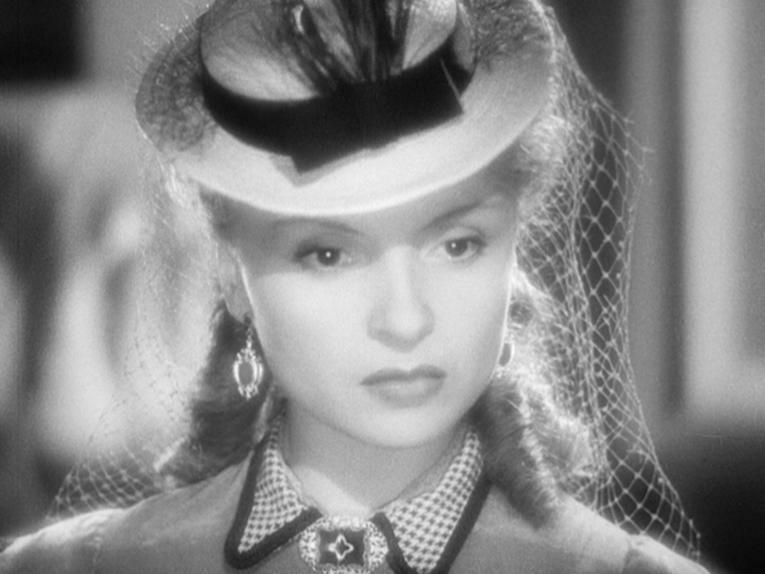 Joyeux is Zélie Fontaine in the follow-up Lettres d’amour (1942), a young widow of three years and the post-mistress of a village where the litigious gentry scheme to grab power from the business folk. It’s The Society versus The Shop, as the townspeople describe this social civil war, and the true-hearted Zélie is caught in the middle of it when the Society tries to get her dismissed from her position and uses a scandal surrounding a purloined lover letter to leverage they case. But they don’t count on the new district attorney (François Périer) who arrives with his own an agenda, or on their shameless hypocrisy to come back on them. It opens with a visit from Emperor Napoléon III (Jean Debucourt), who sneaks off to walk the countryside with Zélie as The Society frets and fumes waiting to press their case, and it ends on a lavish ball where Zélie’s duplicitous “best friend” Hortense (Simone Renant) plots to humiliate half the town. The class divide is pitched over political power but it plays out in the relatively harmless arena of social appearances and public one-upmanship, which makes the squabbling all the more absurd. 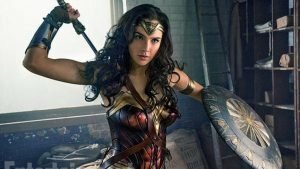 It gives the lightweight comedy a barbed subtext that Autant-Lara was able to sneak past the German watchdogs. I would be overstating things to to suggest that Julien Carette (the poacher of Jean Renoir’s Rules of the Game) steals the film as a dance instructor brought in from Paris by The Society—the performances are perfectly pitched throughout—but it’s not far off. His character is passed off as a doctor who specializes in the mentally ill and the cover is particularly apt given the madhouse around him. The crisp, fastidious performance slips into exasperation as his dancing lessons are turned into covert operations. This is a classic comedy of mistaken identity, petty bureaucratic squabbles, affairs, conspiracies, hidden agendas, betrayals, and two good-hearted young folk in the middle of it all who, of course, end up falling in love. 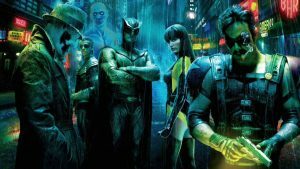 In the tradition of such things, the plot is too convoluted to recount yet surprisingly easy to follow and remarkably clear in execution as the mistaken assumptions, crossed signals, and colliding motives get tangled up with each new twist. It’s a screwball farce played at an easy pace, as if enchanted by the bucolic setting of the provincial village and it makes good on the promise of Chiffon. Douce (1943), set in 1887 Paris (the opening sweep across the city is a marvelous miniature that shows a half-built Eiffel Tower), is the sole tragedy among the comedies and Autant-Lara’s style darkens to match the material. Joyeux is Douce, another teenage romantic in a wealthy family, this time in love with their estate manager Fabien (Roger Pigaut), who loves Douce’s governess Irène (Madeleine Robinson), a woman pursued by Douce’s widower father Engelbert (Jean Debucourt). Above it all is the brittle, unforgiving Countess de Bonafé (Marguerite Moreno), Douce’s grandmother, an imperious and judgmental old woman who personally manages her family wealth because she doesn’t trust her son. Like Lettres d’amour, Douce also tackles class but with a much harsher portrait of class division and prejudice. It’s not just the Countess who guards against the mixing of classes. A priest in the confessional warns a woman (her identity shrouded) that her pursuit of a man from another class will doom her to Hell. The identity is withheld just long enough to give the drama a dash of mystery and establish that the story is built on secrets and lies, but also on loyalty and protectiveness. The film’s greatest strength its nuanced characters. Douce is another of Joyeux’s innocents but her impulsiveness and romantic reveries are eventually counterbalanced with a clear-eyed realization of the gap between dream and reality. The dour, resentful Fabien is a thief but not a cad and he has dreams of his own. The weak-willed Engelbert is resigned to play his mother’s whipping boy and knocks self-consciously through the manor on a peg leg (hidden by fashion but constantly heard echoing through the film) but there’s a wounded, even hopeful romantic under his melancholy. Irène is the realist of the quartet, yet also the most devoted to protecting those she loves and, in her own way, she loves everyone in the household. Critics cite Douce as Autant-Lara’s masterpiece of the collection and he is certainly in command of his art here. The shadowy beauty of the manor’s interior suggests a sense of life held bay and the past desperately preserved within the walls by the Countess, holding on to privilege while the world passes by outside. The characters seem to haunt the manor rather than live there and they are forever isolating themselves in their own rooms. In the few group scenes, Autant-Lara is constantly separating them across rooms or on different floors. Even when the enormous Christmas tree is installed and decorated in the grand entry, it isn’t cheery or festive so much as overwhelming and imposing. This is not a happy and warm Christmas. There’s a touch of the Gothic here, a mood that warns us that there are no happy endings awaiting these characters. I’m not just more partial to his comedies, however, I’m more impressed by them. Autant-Lara is more surreptitious in the way he slips his themes into the stories and his deft way with comedy is deceivingly effortless. 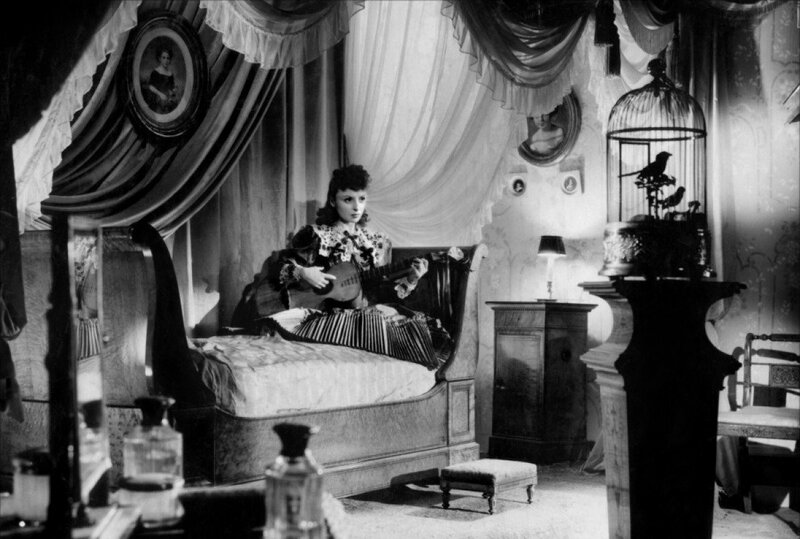 The most lovingly crafted film in the set is the romantic fantasy Sylvie et le fantôme (1946), a much more subdued, subtle comedy set in a castle haunted first by the portrait of the dashing family ancestor Alain de Francigny, “The White Hunter” who died in duel over the woman he loved, and then by ghost of Alain himself, who escapes the portrait as it is sold off, boxed up, and carried out a secret passage. Sylvie (Joyeux, playing sweet sixteen again at the age of thirty) is so obsessed with that romantic family myth that her doting father (Pierre Larquey), guilty at having sold the painting to keep up the castle, hires an actor to play the ghost of Alain for her sixteenth birthday ball. He ends up with three: a smitten young suitor (Jean Desailly), an escaped thief (François Périer) hiding out from police, and a huffy old stage professional (Louis Salou) who won’t stop complaining about how this is beneath him. The phantom himself is determined to take his turn as well. Julien Carette is back to play the family butler and father’s accomplice in the ghostly theater. It’s adapted from a play and Jean Aurenche’s script uses the dramatically-timed entrances and exits to great effect, but this is far from stage-bound. The film expands to fill the entire castle, from subterranean tunnel to ballroom to attic, and Autant-Lara choreographs the action to carry us through the space rather than simply cutting from scene to scene. 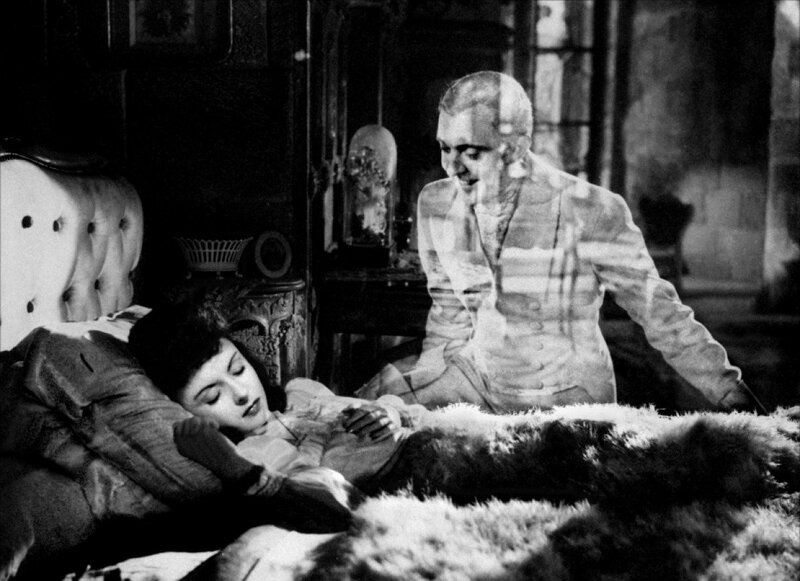 The simple but beautiful visual effects of the ephemeral phantom by cinematographer Philippe Agostini are masterful, perfectly engineered to place the transparent ghost in the midst of scenes when he interacts with objects yet is unable to connect with humans, and Autant-Lara brings a comic poetry to the images in his direction whether he’s bemusedly watching the human drama or phasing through walls and floating through floors. Jacques Tati, at the time a cabaret star, made his film debut in the film, appropriately enough in the non-speaking role of the phantom. He doesn’t suggest dashing so much as benevolence and however smitten he is with Sylvie, he seems even more pleased simply by his newfound freedom from the painting. The sheer joy he takes in phasing through walls and floors to explore the castle and check in on the doings of the mortals is evident in the playfulness of his movement and the amused smile and twinkle in his eye throughout his castle walkabout. Sylvie et le fantôme was released after liberation of France but was developed and initiated during occupation and thus makes a perfect endcap to the collection. According the notes by film historian Nicholas Elliott that accompany the set, Autant-Lara turned his attention to more serious films after the war (his next film was Devil in the Flesh). 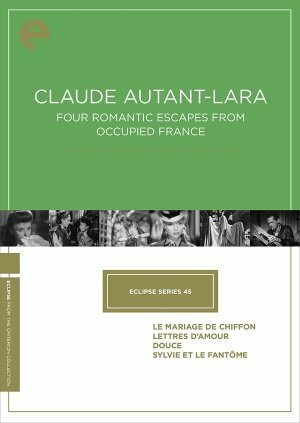 As Autant-Lara’s films are at best difficult to find in the U.S. and most are simply unavailable, I’ve nothing to compare them to. But on the strength of this set, I look forward to any opportunity to continue exploring his career. All four films make their DVD debut on the US in this set from the Criterion budget line Eclipse, which has been dormant for a couple of years now and makes a welcome return. Criterion has used this line to release sets of films in stripped-down editions with no supplements beyond generous notes and essays. Two of the films are mastered from French restorations but they have not undergone the more elaborate restoration process of the premium Criterion editions and you can see minor damage and visual fluctuations to varying degrees in all four films. They are, however, perfectly lovely editions and Sylvie et le fantôme in particular looks beautiful.